I heard about The Pharmacy after returning to Nashville in August, and decided I better give this Burger Parlor and Beer Garden a try. This relatively new establishment is located in East Nashville behind The Holland House. It’s a fairly small restaurant with limited inside seating, but they do have a good sized outdoor patio if it’s a nice night. The Pharmacy serves 100% TN beef, or turkey if you prefer. I’ve been to The Pharmacy twice now, and both times I stuck with the traditional Pharmacy Burger: yellow cheddar, iceberg lettuce, sliced tomato, onion, pickle, ketchup, and mustard. While it was a good, solid burger, I will probably try one of their more unique burgers next time. The Pharmacy Burger just wasn’t that memorable. I’ve heard great things about their more unique burgers, such as the Mission City Burger, which features guacamole, pico de gallo, and black beans. One of my pet peeves is a bun that falls apart as you are trying to bite into your mouth-watering burger. This bun held up great! The bun (made specifically for The Pharmacy by local bakery Provence) was lightly toasted, and tasted so fresh and wonderful. It held everything together, and was the perfect meat:bread ratio. Each burger comes with your choice of side. 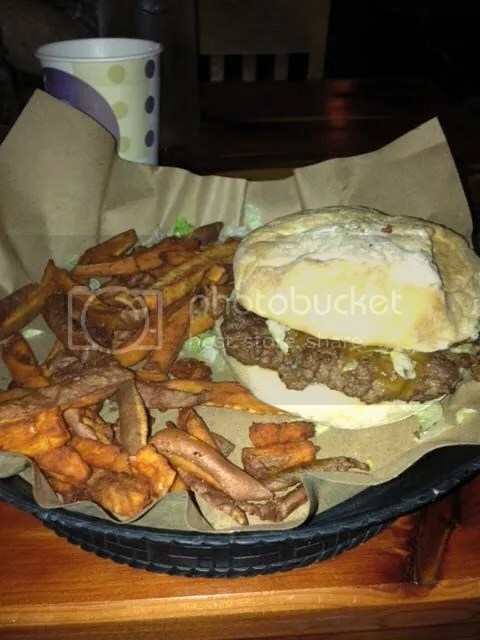 I coupled my burger with the sweet potato fries, and while they were good, I’ve had better. They just tasted like maybe they had been sitting around a little too long. 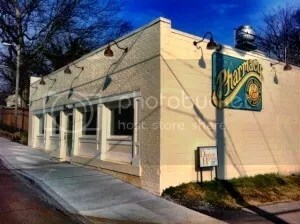 In addition to unique, hand crafted burgers, The Pharmacy also offers a wide variety of craft beers, and homemade sodas called phosphates. They actually have an old fashioned soda rail, and make their own orange, ginger, lemon and mint sodas with all natural ingredients. I ordered a Yazoo Pale Ale, but my friend ordered a lemon phosphate and it was delicious! What I really liked about this place was the atmosphere. It’s just a fun place to hang out and enjoy a reasonably priced, gourmet burger with friends. Although you usually have to wait a little bit before getting a table, the service is really fast and attentive once you are seated. Overall, I thoroughly enjoyed both of my visits to the Pharmacy, and will definitely be back. It’s a solid burger at a reasonable price.